The German Evangelical Congregational Brethren Church (known simply in the community as the 'Brethren Church') originally began as the Free Evangelical Brethren Church in December 1900 and was led by church elders rather than ordained ministers. On September 13, 1922 the church was reorganized as the German Evangelical Congregational Brethren Church and shortly afterwards it was incorporated. Reverend Conrad J. Wagner was its first pastor and he served until his death in November 1934. It is likely that Rev. Johannes Hopp played a key role in selecting Rev. Wagner bringing the congregation under the German Congregational denomination. The congregation of the German Evangelical Congregational Brethren Church. This photo was likely taken around 1927 when the newly built structure on NE Mason Street was completed. Reverend Wagner is standing the left of the utility pole. Photograph courtesy of Steve Schreiber. In 1926, the church reported 97 male members and 98 female members. In addition, there were 110 people in the Young People’s Society. Under Rev. 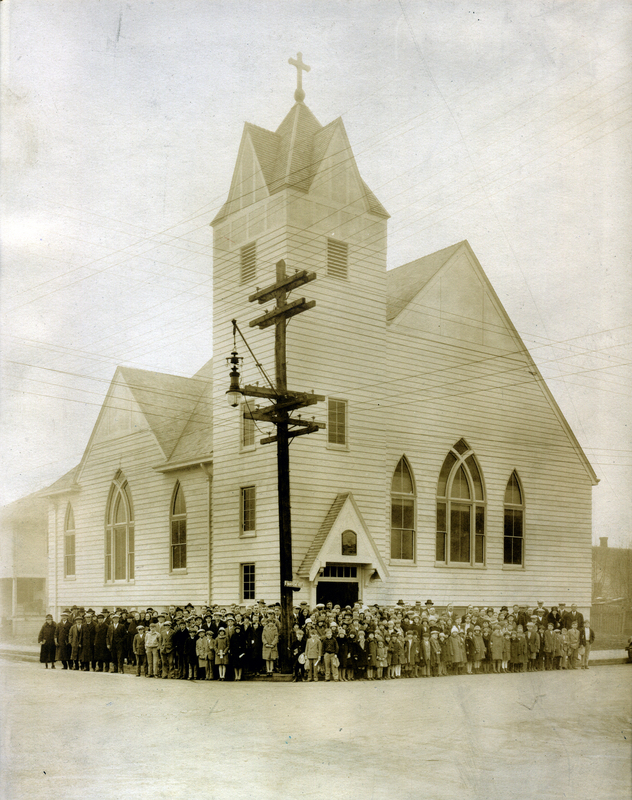 Wagner, the church moved from the location at 3605 NE Mallory to a newly built structure at 238 NE Mason in 1927. The new structure was erected at a cost of $24,880. Several members of the congregation were garbage haulers and they used their trucks to move the dirt excavated by hand for the church foundation and basement to 620 N. Fremont Street where it was used to fill the site for the new Eliot School (now Boise-Eliot). The church structure built in 1927 stands today. In 1932, a fire partially destroyed the sanctuary. The $5,320 loss was insured and three months later the church was rebuilt and returned to use. The trouble at the church Sunday was the outgrowth of bad feelings which has prevailed among the two factions for many months. Last fall eight members of the then church council filed suit in circuit court seeking to oust the Rev. Conrad Wagner as pastor, assertedly because he preached almost exclusively in German and because he objected to having motion pictures exhibited in the church building. The plaintiffs in the suit alleged that the Rev. Mr. Wagner was a troublemaker. According to Conrad Krieger, one of the complaining witnesses, the first fight Sunday occurred at the afternoon prayer meeting when one of the elders nominated a former member who had been excommunicated and a present member to lead the meeting. A number of persons present objected to having the excommunicated member lead the service but he started to go to the platform, Krieger said. Fists began to fly when some of the objecting members attempted to keep the excommunicated member from going to the platform, Krieger said. Several persons were scratched and bruised in the fight, which was resumed outside the church building after the night service, participants said. Four police radio squad cars were called to quell the night disturbance. Police reported that several blows were struck but that no arrests were made. They said the fighting was over when they arrived, but that groups were standing about discussing the matter. The police were informed that a battled had occurred inside the church in the afternoon when some 100 were assertedly engaged. It was said that between 50 and 75 men and women engaged in the night conflict. Police had been called to restore order on two or three occasions. The church fight was carried into court last fall, when eight members of the council brought suit seeking an injunction restraining the Rev. Mr. Wagner from continuing as pastor. Circuit Judge Lusk on November 23 denied the injunction. The brawl occurred despite a warning in January 1934 to five of Rev. Wagner's opponents by Deputy District Attorney Bill Ralston who cautioned them not to cause a disturbance at the church. Rev. Wagner resorted to hiring a body guard to protect him from his enemies. Although he was victorious in is legal battle, Rev. Wagner was worn down by the strife within his congregation when he died in Portland on November 17, 1934. Following Rev. Wagner’s death, Reverend Richard Schmalle served as interim pastor for a period of six months. Rev. Edward Graumann became the pastor in the spring of 1935 and served until the summer of 1944, he realized the necessity of changing the services by instituting the English language in order to captivate his audience. The Brotherhood clung tenaciously to their mother tongue and prayer groups until about 1980 when most of the older members had been laid to rest. Reverend Edward Eslinger was called to replace Rev. Graumann in 1944 and he served until November 1945. The following summer the Reverend Carl F. Brost became pastor and served the church until the fall of 1949. Mr. Oliver Ketterling, a student at the Western Theological Seminary of the Evangelical United Brethren (EUB) Church, served as student pastor from September 1949 to June 1951. In August of that year, the Reverend John N. Sauer began his long ministry, retiring August 1963. He shared with the Rev. Wagner the honor of each serving the church for twelve years. Reverend Theodore Strobel returned to Portland from California to live in retirement but he consented to lead the church for four years after Rev. Sauer stepped down. In December of 1966, the Brethren and Zion churches voted and approved a merger of the two churches. In April 1967, a consolidation plan to merge the congregations was adopted and the Zion parsonage was sold. The first service of the newly merged congregation was held in July 1967. The farewell service at the Brethren Church was held on August 6, 1967 and 155 members joined the Zion Congregational Church with its 265 members to become the Zion Brethren Church of the United Church of Christ. The congregation would later become the Rivercrest Community Church. Following the merger, the Brethren Church building was sold in October of 1967 for $35,000. During its 44 years of existence, the church had the spiritual leadership of eight ministers who presided over 225 wedding, 488 baptisms, 522 confirmants and 269 funerals. Krieger, Joanne, Trans. "Brief History of The Brethren Congregational Church." Evangelical Congregational Brethren Church, Portland, Oregon, 1922-1967. Portland, OR: n.p., 2000. 1-6. Print. Churches Along The Oregon Trail, Central Pacific Conference of the United Church of Christ, Portland, Oregon: 1976, p. 68. Wagner, Rev. J. C. "Local Church Report for the year ending December 31, 1926 for the Congregational Year Book." The Oregon Daily Journal, clipping circa 1927, p. unknown. "Both Sides Score in Church Battle." The Oregonian [Portland], November 14, 1933, pg. 1. "Victory In Court Gained By Pastor." The Oregonian [Portland], November 23, 1933, pg. 1. "Law Takes Hand In Church Broil." The Oregonian [Portland], February 6, 1934, pgs. 1 and 3.